For three long years I have been riding the Gold Line past the L.A. State Historic Park, watching the park renovation progress and wondering when it will open again. Well, the wait is over. The grand opening of the LASHP will be taking place on none other than Earth Day, which this year is Saturday, April 22. DTLA skyline behind the new welcome center. Enjoying the view from the Roundhouse Bridge with park rangers Luis Rincon and Kya-Marina Le. A wider view of the Roundhouse Bridge and DTLA behind it. Gold Line making its way past the park. There probably is no other state park in California that can be so easily reached via rail transit — the Gold Line’s Chinatown Station is a short stroll from the park. There’s also a Metro Bike Share dock at Chinatown Station so you could conceivably go zero-carbon and pedal your way over. Bicycles are also allowed in the park, should you wish to bike all the way in. Just be sure to stay on the trail! On the 22nd, head to the park at 10 a.m. to participate in opening festivities! The free, day-long celebration will include family-friendly activities, food trucks and musical performances by Grammy Award-winning QUETZAL, MILCK , Subsuelo and more. And of course, you’ll be able to check out the new features of this beautiful urban green space: there’s a welcome center with restrooms, a snack bar called Cargo that’s made of recycled shipping containers, the Roundhouse Bridge and Overlook that provides a nice view of DTLA, hillsides covered with California poppies and goldfields, and an orange grove where you are encouraged to pick and enjoy the fruit. Not bad for a former freight rail yard (check out this historic pic). Trying to pick the perfect orange. They’re all perfect. 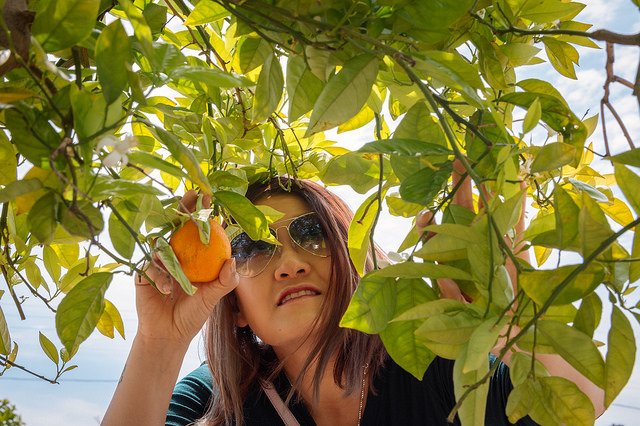 Fun fact about the orange grove: it was incorporated into the park to pay homage to California’s “second gold rush,” the boom of the citrus industry in Southern California that happened around the late 1890s. At one time, Los Angeles County was the highest dollar volume agricultural county in the United States, due largely to navel orange production. The park landscaping is drought tolerant and is mainly comprised of coastal sage scrub and chaparral flora. It also reflects much of the history of Los Angeles. Along the south side of the park where the Gold Line runs, you can meander down the new jogging trail by the Zanja Madre (Mother Ditch), the course of a water system that stretched from the Los Angeles River to El Pueblo in the early 1800s. The Roundhouse Bridge circles the original roundhouse of the Southern Pacific Railroad’s River Station. For those who aren’t familiar with rail terminology, a roundhouse is a wheel-like area of tracks where rail cars can be turned around. The River Station used to sit where the park is now, and it was also the original rail terminus for those arriving in Los Angeles — the “Ellis Island of L.A.” — as our current Union Station hadn’t been built yet. Of course, the tracks are no longer there. The area is now a campfire circle perfect for gatherings. Since the park opens on Earth Day, you should definitely try to do the green thing and not drive there. Note: there is parking, but it will be extremely limited on opening day so you should Go Metro anyway — in fact, the Chinatown Station offers a nice view of the park. LASHP will be open from 8 a.m. to sunset 7 days a week.